The remove control is located at the cardboard that is covering the fan cage connection to the motor. It may also be located at the bottom of that piece of cardboard or flipped the other way. I would not pay this much for that fan! I’m good with the ones Walmart has! 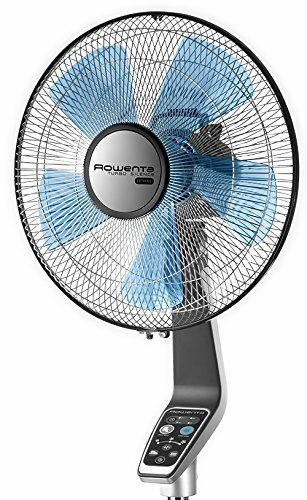 It looks like a nifty fan with plenty of bells and whistles, but you could probably purchase more basic fans that are just as effective at Walmart or another department store at a fraction of the price. I LOVE this fan. Love the quiet coolness it gives. If your in the market for a fan, this one is exceptional. These are brilliant, every home should have one and they are so quiet. Hope we get the weather for using them soon. I REALLY want this fan!! 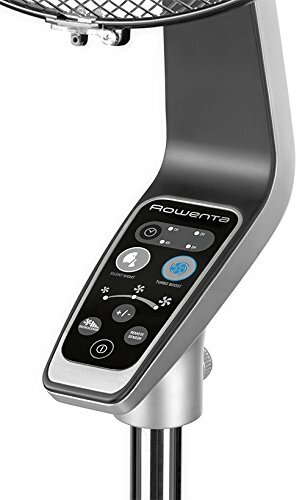 Rowenta makes really high quality irons, so thinking their fans would be too. Like that it has 5 speeds, oscillates and has an 8-hour timer. The silent mode is a nice feature — my hearing aids pick up motor noise and it drives me crazy. I hate to run the air-conditioning during the summer unless it’s really hot for several days — would much rather use a fan to keep cool. For those who talk about department stores (such as Walmart), physical department stores are now very close to extinct. It would be more appropriate to look in any Shopping section of a search engine for a product and the best price. That even saves time!